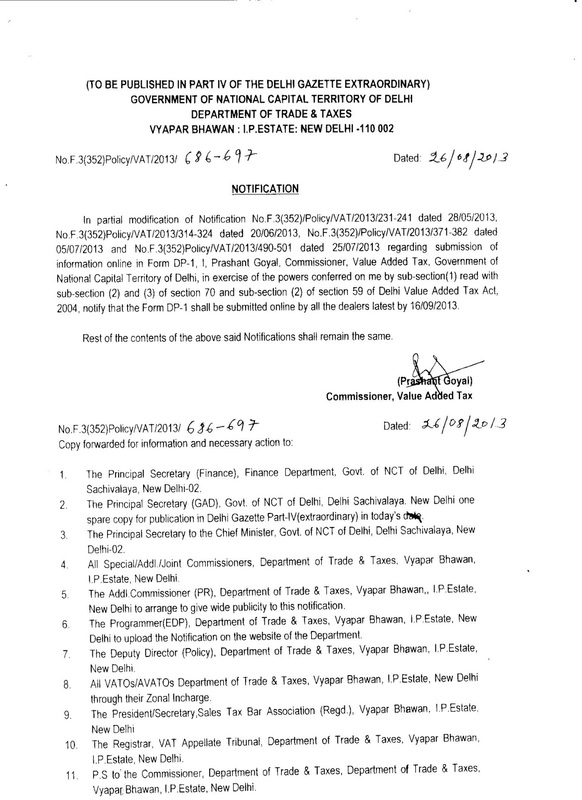 In further modification to Notification dated 20.06.2013 regarding submission of Form DP-1, the last date for filing the form online has been further extended as per the schedule as given below. अब दिल्ली सरकार ने सर्कुलर संख्या 13 dtd 23/08/2013 के जरिये वर्ष 2011-12 और उससे पहले के सभी फार्म जैसे की (C, F, H, E-1 and E-2) ऑनलाइन देने की सुविधा शुरू कर दी है. Partner, N.K. 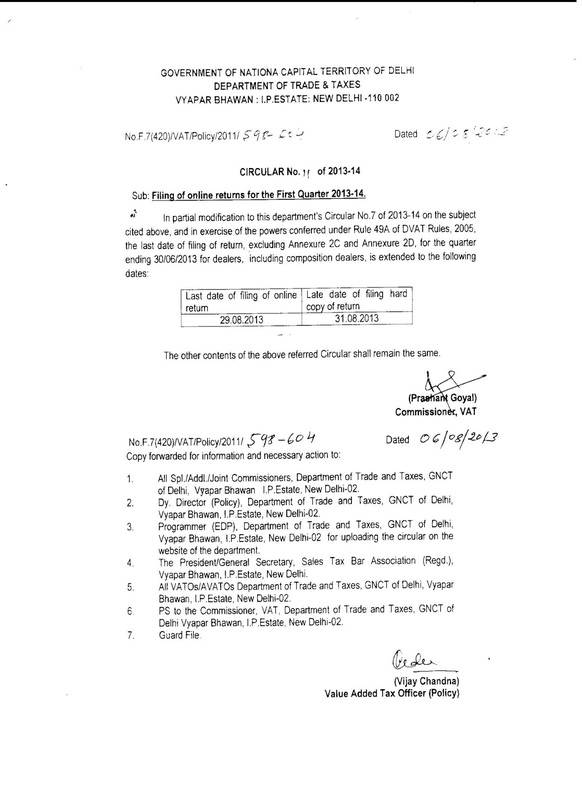 Goel and Bros.
स्टॉक डिटेल को समय पर दाखिल न कराने पर सरकार व्यापारी के ऊपर कर नियमों के अंतर्गत 10,000/- (दस हज़ार रुपये) तक का जुर्माना लगा सकती है ! समय रहते अपनी सूची दाखिल करवा कर हम इस जुर्माने से बच सकते हैं. 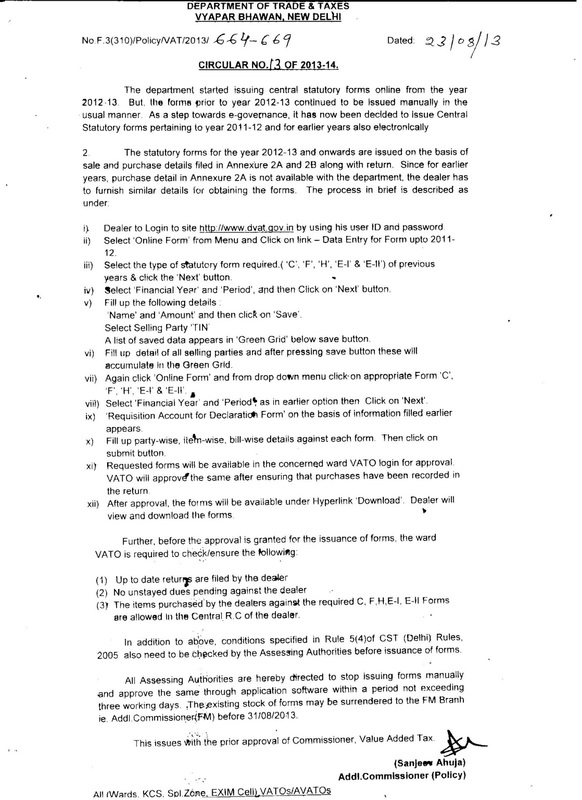 The last date for filing the statement for Dealers having GTO above Rs. 1 Crore the last date is unchanged and remains to be 05/10/2013. 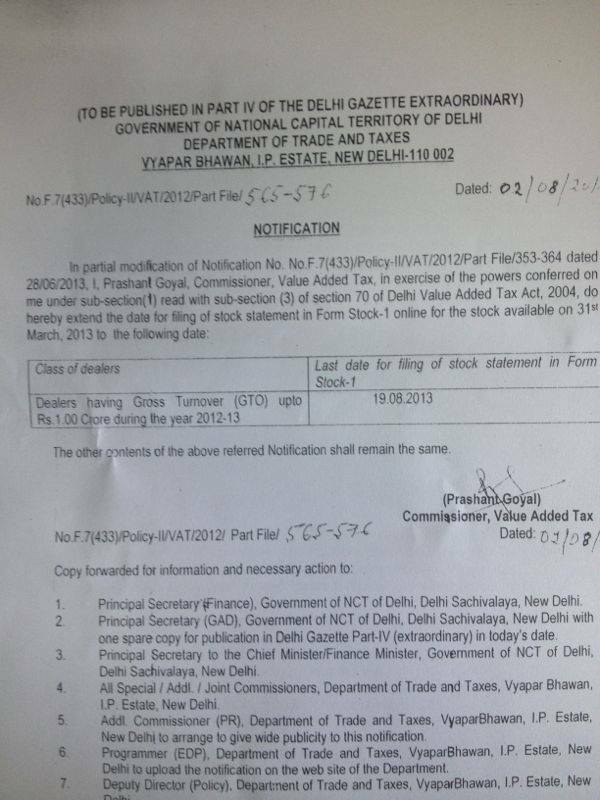 The Value Added Tax Department in modification to Circular No. 7 dtd. 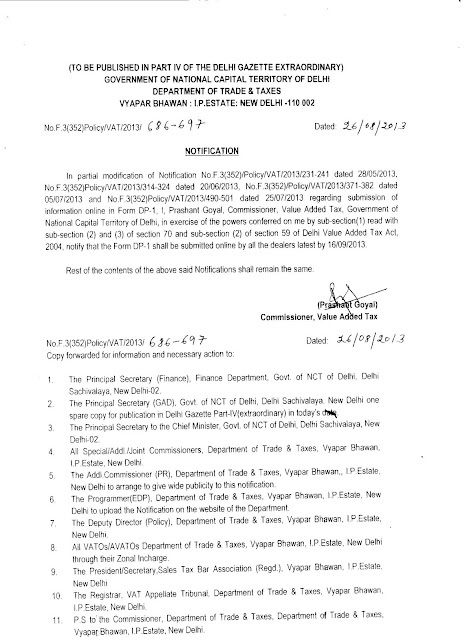 26/07/2013 has vide Circular No. 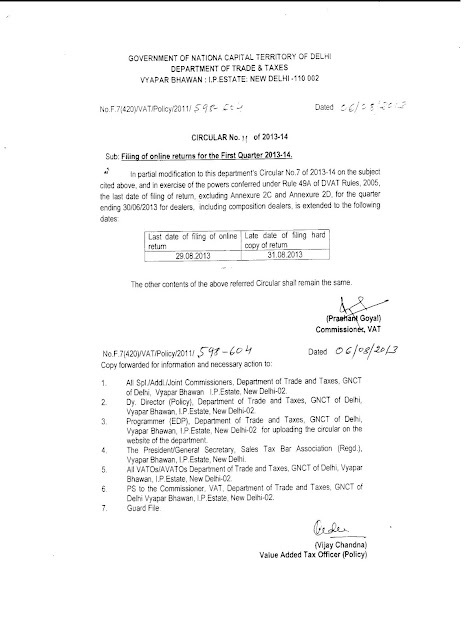 9 dated 06.08.2013, further extended the last date for filing online Return for the first quarter 2013-14. The online version of the same will be made available shortly. 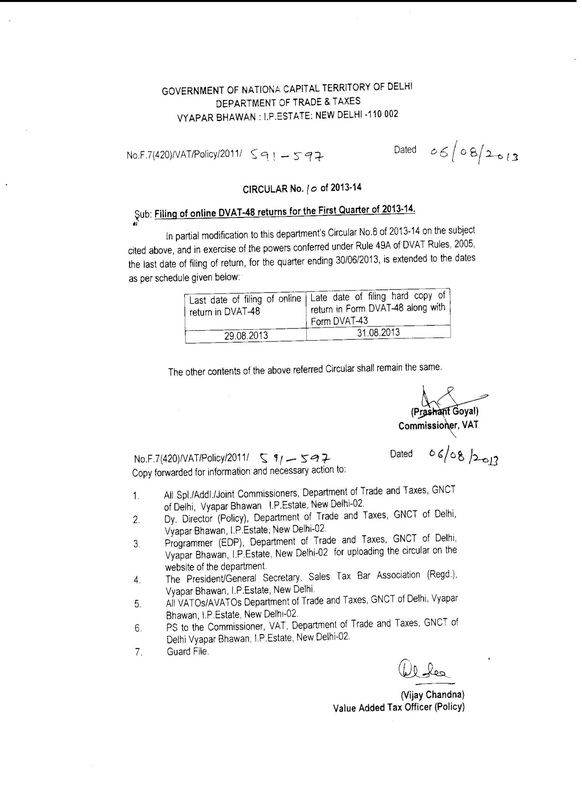 It is to be noted that the due date for filing the Return has already been announced to be 31st August 2013 vide Order No. 3/2013 - ST dated 23.04.2013.